Khirbet Umm el-Amud is a site located in Lower Galilee. Here there are remains of a village that existed from the Second Temple into the Byzantine Periods (unexcavated) and the remains of a synagogue (excavated) that dates to the third-fourth centuries A.D. The synagogue has one column stranding and thus the site is called "the ruin of the mother of the column" in Arabic. The ancient name of the place is not known. I believe that there was a track/road that connected the port of Ptolemais to Cana 17 mi. [27 km. ], Cana to Kh. Umm el-Amud 6 mi. [10 km. ], and Kh. Umm el-Amud to Magdala 6 mi. [10 km.]. It seems to me that Jesus and his followers may have used this track/road on a number of occasions as they traveled from Nazareth to Cana and from there to Magdala. Once at Magdala they could turn north to Capernaum or south to Tiberias. Kh. 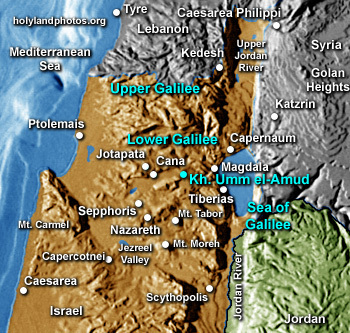 Umm el–Amud is located right along this road, just east of the watershed of the Beth Netopha Valley as the descent to the Sea of Galilee begins. In Hebrew the site is called Horvat Ammudim and another Arabic rendering is Khirbet Umm el–Amed (Grid Ref 1886.2466). Horvat (Hebrew) and Khirbet (Arabic) both mean "ruin." Amud ("column") and "Ammudim" (columns) are Hebrew/Arabic.